Professor McKern is a Visiting Fellow at Stanford University's Hoover Institution, where he is working on innovation in China by local and foreign companies and the strategies of emerging MNCs from rapidly developing economies. Prior to returning to Stanford, he was Professor of International Business and Co-Director of the Centre on China Innovation at the China Europe International Business School, Shanghai. From 2001 to 2007, McKern was the Director of the Stanford Sloan Master's Program (now the MSx Program), a one year graduate program for executives in mid-career. He taught MBA courses in International Business in the Stanford Graduate School of Business, from 2001 to 2010. Between 2008 and 2011, he directed the Merck-funded Research Program on Innovation at the United States Studies Centre in the University of Sydney. He created and directs the Silicon Valley Module of the University’s Executive MBA Program and has directed programs in Silicon Valley for Chinese executives. 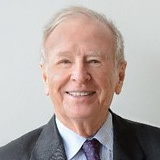 From 1993 to 1997, McKern was Professor of International Business and President of the Carnegie Bosch Institute at Carnegie Mellon University, an institution devoted to research and outreach in international management. Dr. McKern gained a BE in Chemical Engineering with Honours at the University of Sydney. He worked in the chemical industry with DuPont, ICI and Union Carbide, and was a design engineer with Canadian General Electric on the construction of Canada's first nuclear power reactor. He obtained a Doctorate in International Business at Harvard University and subsequently worked in research and postgraduate education in Australia, Europe, China and the United States. His research interests focus on the strategies of international corporations. He is the author or editor of eight books including Transnational Corporations in the Exploitation of Natural Resources (United Nations and Routledge, 1993) and Managing the Global Network Corporation (Routledge, 2003). He has published in academic and professional journals on multinational enterprise, industrial development, and international business, and is the author of a number of recent case studies in the field of international business, distributed by Stanford University and Harvard Business School. His early research was concerned with explaining foreign investment and industrial structure in the global minerals industry. His most recent research is concerned with the strategies of emerging multinationals and with the innovation strategies of local companies and MNCs in China. His most recent article is "Innovation in Emerging Markets - The Case of China", International Journal of Emerging Markets, Vol. 9 No. 1, 2014 ( with George Yip). Dr. McKern has served as dean of two Australian business schools. He was Founding Professor of Management and first Director of Macquarie University's Graduate School of Management in Sydney, Australia; and President and Dean of the Monash Mt Eliza Business School, Melbourne, later merged with Melbourne Business School. Dr. McKern has been a Visiting Professor at INSEAD, IMD, other European and U.S. management schools and the Chinese Academy of Social Sciences, and a member of international bodies and government committees. He is a highly-rated speaker and instructor in executive programs and a commentator in the Chinese and international media on issues of MNC strategy and innovation and strategy in China. He has provided lectures and executive programs for a number of corporations, include Shandong Gold, Nitto Denko, Goodyear China, Nestlé China, Schneider, Bayer, Philips, GE China Technology Centre, the Bosch Group, Element 6, Rio Tinto and Symantec, as well as modules in Executive MBA programs for INSEAD, INALDE, Alfredo Ibanez, Australian National University, the University of Sydney and the Berlin Centre for Creative Leadership. He is a member of the Editorial Board of Management International Review and speaks on innovation and MNC strategy in a number of public forums.